Here is a presentation we put together on this case. We skim over a lot of the content, which is covered in greater detail in the written post. We used prezi.com for the ‘virtual canvas’ style presentation. It was a Saturday night in a small suburban ED. 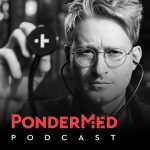 It was my first ever night shift as the senior doctor in the ED – I was intensely nervous and experiencing major cognitive overload! On arrival she looked unwell. She was an obese lady who looked like she potentially had multiple comorbidities. Due to the language barrier, and the fact that she had never attended my ED before, I was unable to obtain a history. 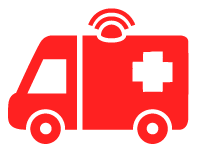 Observations were as the ambulance had reported. At this point she was maintaining her own airway and I could find no immediate respiratory issues. She was peripherally shutdown and obviously in shock. She was agitated, and appeared to be in considerable pain, gesturing towards her abdomen. She was clinically peritonitic – her abdomen seemed rigid and diffusely tender. I managed to get good peripheral access and started pushing IV fluids. ECG showed a sinus tachycardia, with no acute ischaemia. Portable CXR was normal, no free air under the diaphragm. Her lactate on VBG was 5. My two main differential diagnoses at this point were ruptured AAA and septic shock (as she was febrile). Needless to say, I was very concerned about this lady and panicking! I knew that I needed to rule out AAA with a bedside ultrasound, but did not feel confidant enough in my own ability to do that. I had also never performed RSI or placed a central line without close senior supervision. I knew that I needed help. In my state of panic, I decided to call the surgical registrar as my primary differential was ruptured AAA (and surgery were covering vascular emergencies). He said he would come in, but was off site and so would be at least 20 minutes. She was starting to drop her GCS, and her BP didn’t seem to be improving with aggressive IV fluids. I felt out of my depth. I had never been the chief decision-maker before and so decided to put a MET call out(!). This is where a team of doctors from the wards (who normally attend ward-based emergencies) come running to help you, with the team leader being the ICU registrar on-call. They arrived and I immediately felt calmer. I explained the situation to them whilst a member of the team examined the patient. An experienced operator performed a bedside ultrasound that ruled out a ruptured AAA. She was getting drowsier by the second and the decision was made very quickly to perform an RSI, place an IJ CVC and arterial line. Soon after the arrival of backup, some family members of the patient turned up. They also were largely unable to speak English, but they brought with them a shoebox full of the patients’ medications. Amongst multiple antihypertensives, other routinely prescribed meds, and some herbal remedies… were hydrocortisone and fludrocortisone tablets. The ICU registrar clocked it immediately. This patient might have been in adrenal crisis. She was promptly given 100mg IV hydrocortisone just before being transferred to the ICU via the CT scanner. The adrenal gland consists of the adrenal cortex and medulla. The medulla produces catecholamines – adrenaline + noradrenaline. Their production is under neural control. The cortex produces glucocorticoids (cortisol), mineralocorticoids (aldosterone) and androgenic steroid hormones. Cortisol is essential for life. It is regulated by the hypothalamus-pituitary-adrenal (HPA) axis. 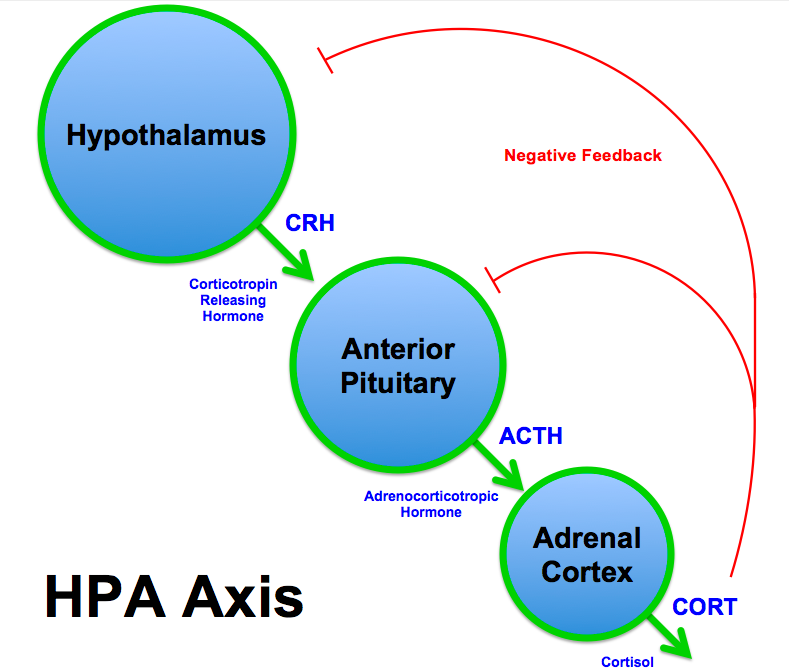 Stressors (such as trauma, infection, hypoglycemia) stimulate the hypothalamus and anterior pituitary gland to produce more CRH and ACTH respectively. This, in turn, increases cortisol production. Cortisol is a ‘stress hormone’. Aldosterone acts primarily at the distal tubules of the nephron in the kidney. It promotes the reabsorption of sodium, and the excretion of potassium and hydrogen. 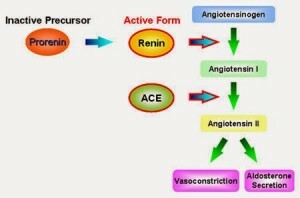 Aldosterone levels are regulated by the renin-angiotensin system (not the HPA axis). This is failure of the adrenal gland. It is also known as Addison’s disease. There is a deficiency of cortisol and aldosterone, and a lack of negative feedback suppression of ACTH. The classical ‘year-long tan’ is secondary to excess ACTH stimulating melanocyte receptors in the skin to produce melanin. Hyperpigmentation is most prominent in palmer creases and recent scars. In women, loss of adrenal androgen leads to thinning of pubic and axillary hair. This does not occur in men as the majority of androgens are produced in the testes. The characteristic biochemical disturbance secondary to aldosterone deficiency (hyponatraemia, hyperkalaemia, metabolic acidosis) is not always obvious, and is rarely severe if present. This is failure of the anterior pituitary gland to produce ACTH. The most common cause is chronic exogenous steroid therapy. This suppresses ACTH production from the anterior pituitary, which induces adrenal atrophy (reduced capacity to produce cortisol). The clinical features are similar to primary adrenal insufficiency. However, a key difference is that aldosterone levels are unaffected, as the RAS axis remains intact. The characteristic biochemical profile of Addison’s disease (hyponatraemia, hyperkalaemia, metabolic acidosis) is not present in secondary adrenal insufficiency. Postural hypotension and salt craving are absent. Symptoms often relate to a deficiency of other pituitary hormones (GH, TSH, gonadotropins). 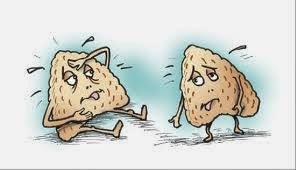 Hypoglycaemia can be a more prominent feature of secondary adrenal insufficiency owing to concurrent low growth hormone levels. Men as well as women can exhibit signs of androgen deficiency secondary to insufficient gonadotropin hormone from the pituitary. We will see this in the ED. We need to understand it so we can diagnose and treat it in resus! Chronic adrenal insufficiency, where an acute illness (stressor) overwhelms the patients’ limited capacity to produce cortisol. There is almost always a precipitating illness/stressor. Sometimes underlying adrenal insufficiency does not become apparent until an acute stressor precipitates a crisis. The cardinal feature is shock out of proportion to the severity of the illness. The shock is refractory to fluid resuscitation, and often vasopressors. Clinical features can mimic acute gastroenteritis with nausea, vomiting and abdominal pain. Abdominal pain can be severe, and so adrenal crisis can easily be mistaken for an acute abdomen (I thought I was dealing with a ruptured AAA!). This picture is a particularly pronounced in acute adrenal ischemia/haemorrhage. Sudden severe headache associated with hypotension and bitemporal hemianopia suggests acute pituitary haemorrhage/ischaemia (‘pituitary apoplexy’). It can also present as severe hypoglycaemia. Make sure blood sugar levels closely monitored, and treated appropriately. 100mg Hydrocortisone is the steroid of choice as it also has mineralocorticoid properties. This will be given 8 hourly for at least 24 hours, though the patient should be in the ICU by the time a decision has been made to start tapering the dose. Electrolytes, serum cortisol and ACTH should be ordered, but this should not delay giving the hydrocortisone. 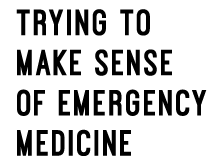 Diagnosing the etiology of adrenal disease/crisis is largely beyond the scope of the ED. Very well. She was extubated two days later and discharged soon after that. She responded very well to the steroid replacement therapy. It turns out that she had autoimmune Addison’s disease, and had made the decision a couple of weeks prior to cease all of her regular medications and replace them with herbal remedies (!). She developed gastroenteritis, which pushed her into adrenal crisis due to her absent adrenal reserve. Perhaps I should have called the ED consultant on-call at an earlier stage, and had I recognized adrenal crisis earlier perhaps she would have avoided RSI/other invasive procedures. Having said that, I think my hands were tied due to the language barrier, and a lack of available collateral history when she first presented. Am I slightly embarrassed about putting a MET call out? Yes! But at least it got the ICU registrar into resus sharpish!